(For Ordering Information, email books@gendertrainings.com. This workbook helps executives, managers, and corporate staff understand and utilize the differences between women and men. It is especially focused on building leadership qualities, and helping blend the naturally different leadership styles of women and men. Where Is Executive Leadership Going in the Contemporary Workplace? Marketing, selling and advertising to Women and Men. Exercises and worksheet pages are included in the workbook, as well as references and notes. "Michael Gurian's information is powerful and critical to business." 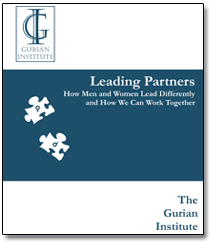 "Michael Gurian's work has the power to turn men and women from adversaries into respected partners." "This is an excellent program for business environments seeking improved productivity through reducing gender stress and improving relationships." "I find your theories and assessments to be right on target." Michael Gurian is one of North America's most dynamic speakers. His presentations are interactive, humorous, insightful and practical. If you would like to bring Michael to your corporation or firm, click here and provide your contact and other information. The Gurian Institute Corporate Division also provides certified speakers and trainers in specific content areas, including Leadership, Management, Sales, and Marketing. All are dynamic speakers and bring their own personal and powerful commitments to GenderLeadership training. Joining Michael, these specialists can help you build extended pilot or training programs. Click here to let us know how we might help you.